It has occurred to me that I should be including some information on the materials I use to make these. 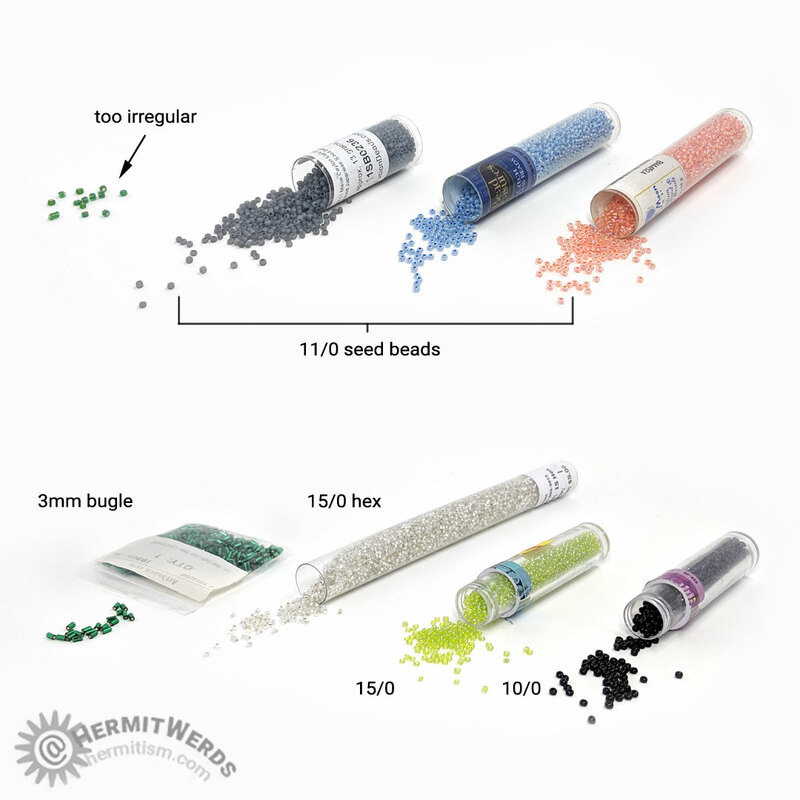 My main supplies for all bead critters are 11/0 seed beads and 32-34 gauge wire. I make a note when I use additional materials. 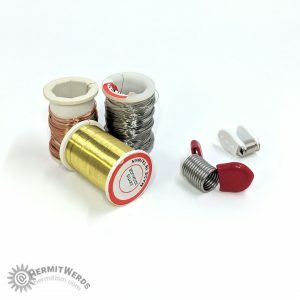 The 32-34 gauge wire is pretty common in craft stores and comes in silver, gold, and copper colors. 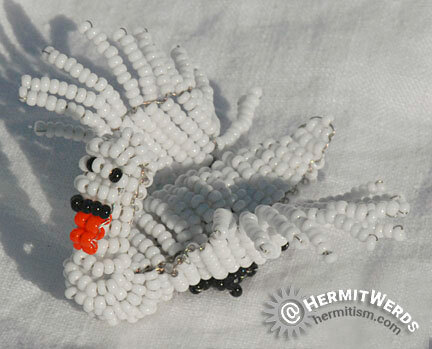 If your local store does not have any, I hear good things about ParaWire from the French beaded flower communities, and they do have lots of different gauges in different colors. I am not affiliated with them nor have I purchased from them before so please keep that in mind and do your own research. I have occasionally been able to salvage copper wire from old electronics (like an old flashlight you could “shake” to charge), but this wire tends to be softer which means your critters won’t hold their shape as well. Bead stoppers are also really great. Nothing is sadder than having all your beads fall off your wire because you paused to take a sip from your drink. 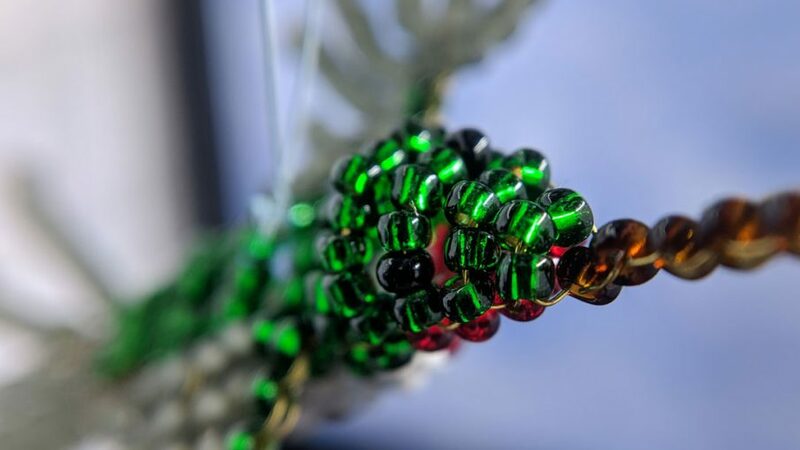 As for seed beads, I prefer the slightly cheaper uneven beads at the 11/0 and up sizes because then you have a little variety in bead thickness to choose from which can really improve the shape of your critter. Using the more uniform Toho, Miyuki, etc. beads will give less character so I avoided them until I couldn’t find the color elsewhere. This does not apply at 15/0 because they are so small. Most of my beads are from old Blue Moon seed bead tubes that Michael’s discontinued and Hobby Lobby, which, I know :(, but they have the right amount of size variability. 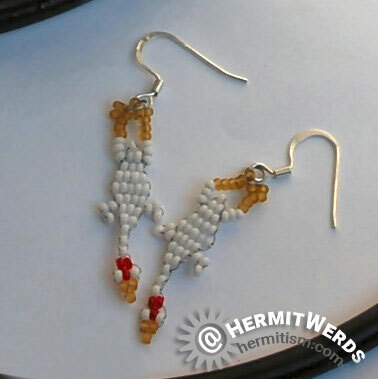 In general, I think Czech seed beads may be your best bet. They even come in hanks so they are pre-strung. Very convenient. Also keep in mind that pearl/ceylon finishes are sprayed onto the bead after they are made and such beads will be slightly thicker than regular beads of the same size. 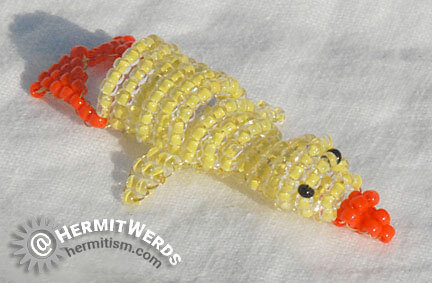 Let’s get to the bead critters, eh? Her site is old (2013), in frames (which means no direct links to the pattern page), and in French, but the patterns are all available for free. A dear friend loves and owns Citron-crested Cockatoos and they are truly beautiful birds. I made one of these for her. Matte Toho beads were used for the crest. 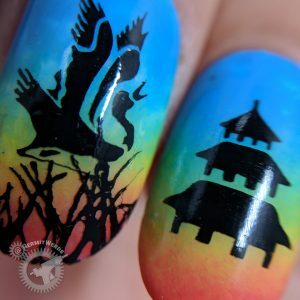 It’s a little hard to see since they are so light, but they are rather square in shape. 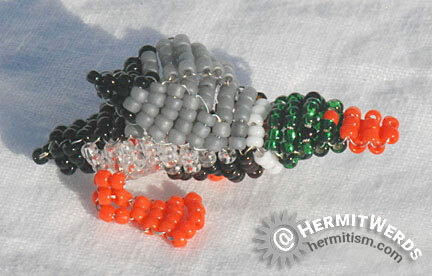 This little Mallard duck is very cute, but its legs just never worked for me. They do balance out his shape a little so he can stand, but I don’t really like their shape. I love this pencil topper and it’s very sad that she only made one pencil topper pattern. I would not recommend this for a pencil that is going to be in and out of a pencil case or bag (the wire will eventually bend too many times and start breaking), but for a pencil that staysat your desk, this is adorable. It is possible you could make this with string/elastic so it’s more durable/usable, but I have not tried that. As I recall, I altered the pattern to make his base bigger so he’d fit on my pencils. Keep that in mind as you bead and have your pencil/pen on hand so you can test for fit. Given my previous experiences with getting things to stand up, I knew this flamingo wouldn’t be able to stand unless I made some changes. 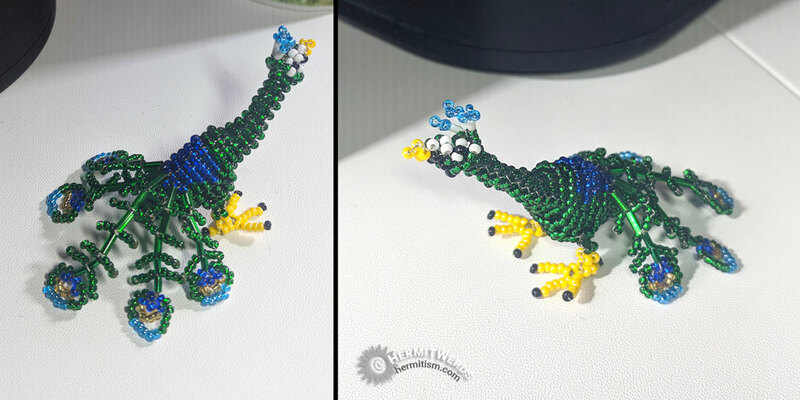 I stuck a thicker piece of wire up his legs and made them with stacked 10/0 beads instead of the usual seed bead weaving. I do wish I’d made his toes with 15/0 beads since that would be more aesthetic, but I probably did not have them at the time. He still doesn’t stand great because he’s top heavy. I also folded his beak under since Marilyne’s design has a long beak more in the line of a sand piper than a flamingo. 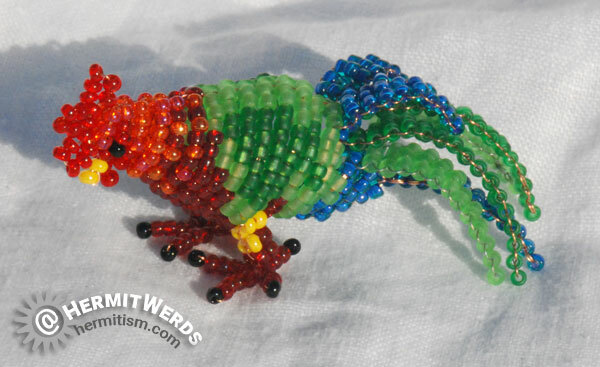 I don’t have a favorite bead bird, but this rooster tugs at my rainbow-loving heart strings the most. He’s so pretty! Marilyne’s pattern uses different colors, but as with all things you make yourself, you decide what the end result will be. Roosters are so pretty. If only they were more quiet! Marilyne also had a cool, scarf-wearing penguin that I never made. 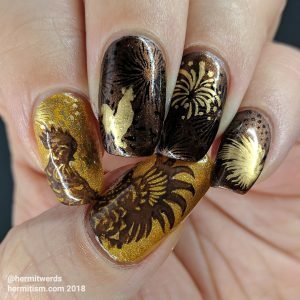 She also has a pattern for a hen and an eagle whose head I stole to make a hippogryph (we’ll get to the fantasy category eventually). 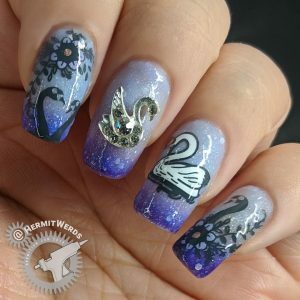 This swan is quite big and beautiful. And that’s part of the problem! 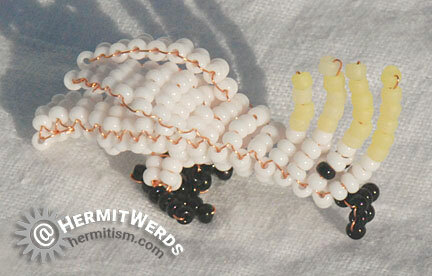 It’s probably one of the largest bead critters I ever made and it suffers a lot from droop because it’s so heavy. I’d use a thicker wire whenever possible when making this one. Anja’s book also has patterns for a cheesy duck, a Great Blue Turaco, a Marvelous Spatuletail, a (wise) owl, a penguin and its baby, and a song bird that I never made. 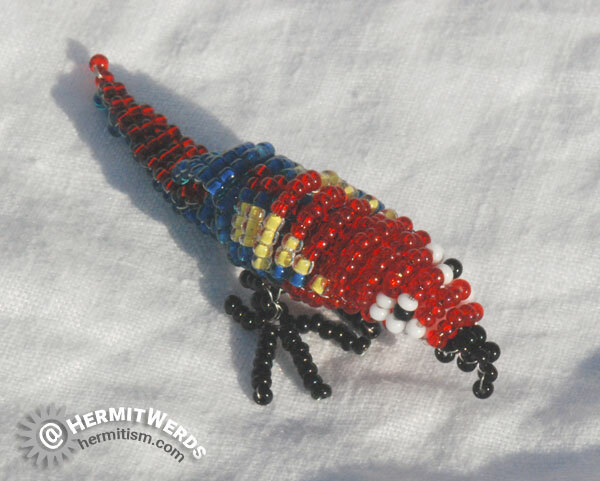 When it came to beading my first hummingbird, I had to make one that reminded me of home. My dad maintains two hummingbird feeders and we only get the ruby-throated hummingbirds in them (unless you count the occasional wasp). Since no one else had a pattern for my particular breed of hummer, I learned a little from their patterns and made my own with a lot more flare for the wings and tail. Then I ended up giving this little guy to my dad. I keep playing with the idea of making more patterns for other hummingbird breeds, but the time for that hasn’t come yet. 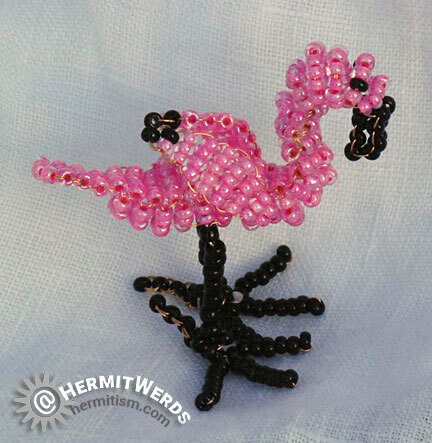 This is the third group of bead animals I’ve restored to the site (see: ocean/water and misc. mammals). 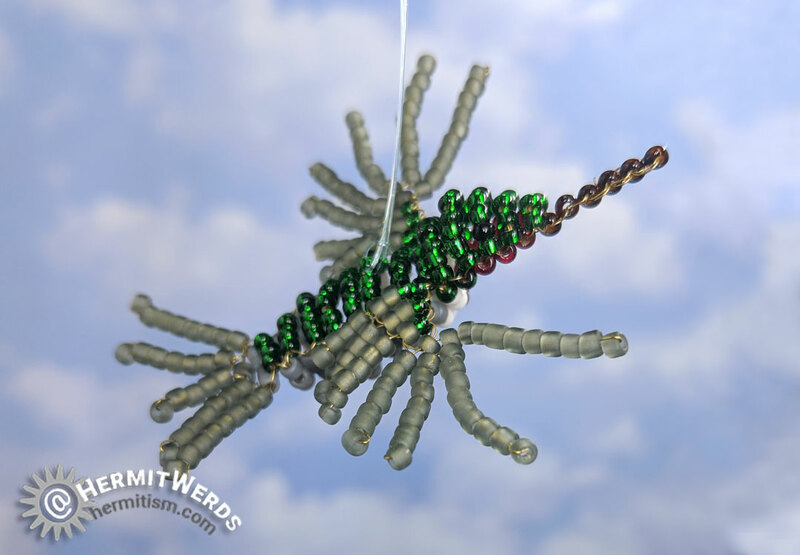 We still have bugs/butterflies, fantasy/mythical, and my bead spiders to go! 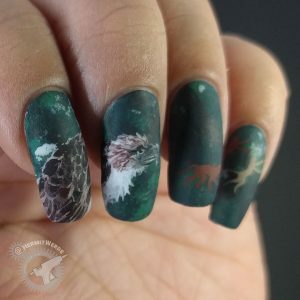 In case you were curious about my nail art, here are four favorites that include some of the animals we looked at today.